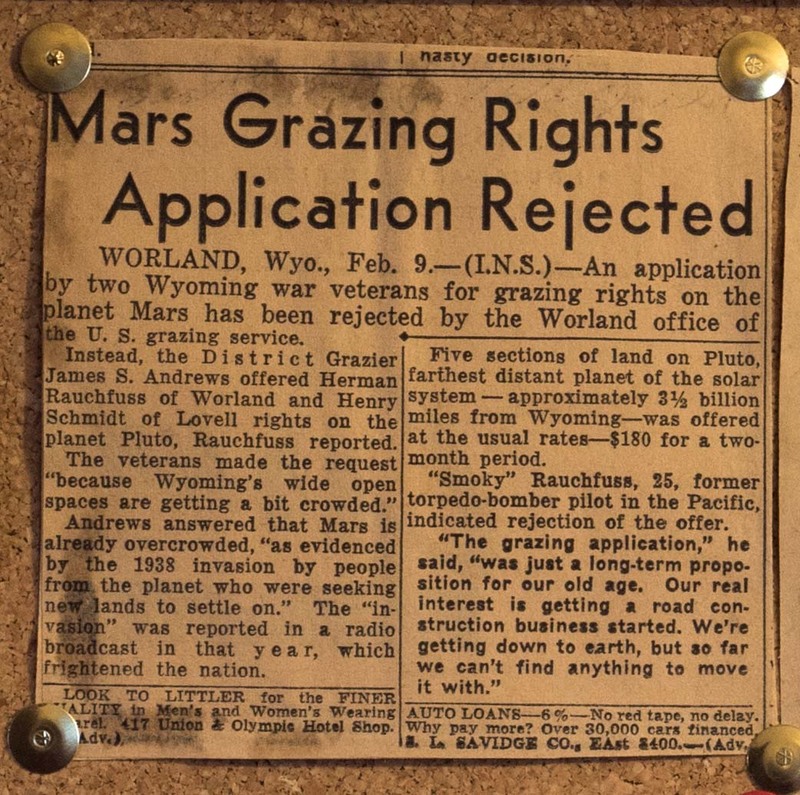 We have really met all kinds of people here in Cody and Powell and today we met the son of a man who applied for cattle grazing rights on Mars. That is the planet Mars, as it is referred to in 1946 documents. He was rejected and instead was offered land on Pluto. Russ Rauchfuss remembers growing up on the homestead established by his father and mother along the main highway between Cody and Powell. The May 19 blog had a picture of a red, white and blue tank next to a barracks building. Russ painted that in 1968 or ’69. But the real story for the blog is Herman, Russ’ father. Herman served as a pilot in the Pacific during WWII, returned to Wyoming and found himself one of the first recipients of a homestead in the Heart Mountain District and bought a barracks for $1.00. His wife was a model and stayed in Wyoming to help Herman work the land. Russ continues to live part-time in the house composed of a former barracks. 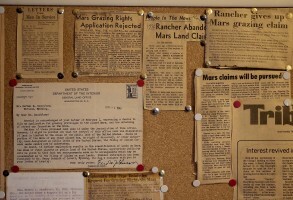 Clippings and a letter from 1946, articles from 1976 after the Viking landings on Mars. 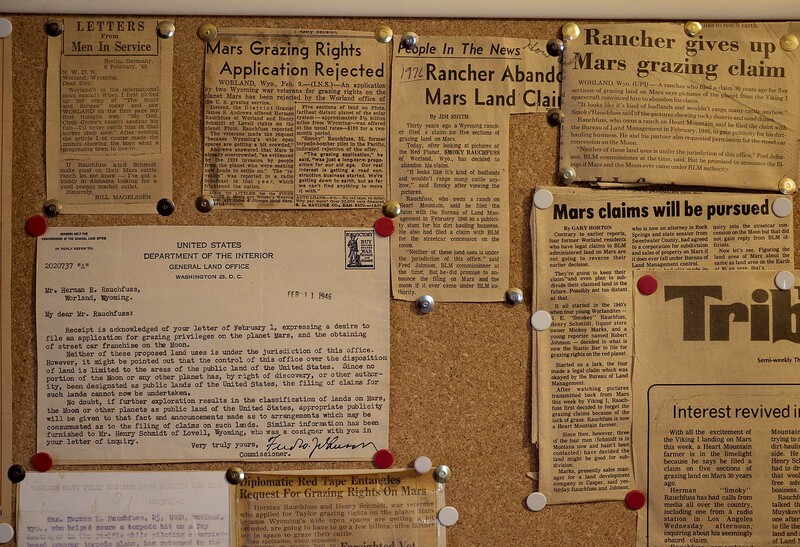 In February 1946 Herman and friend Henry Schmidt applied to the local office of the U.S. grazing service for grazing rights on Mars. 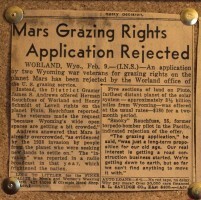 Unfortunately they were rejected, but District Grazier James S. Andrews offered Herman and Henry rights on Pluto, described as approximately 3 ½ billion miles from Wyoming. Apparently they also expressed a desire to obtain the street car franchise on the Moon. The commissioner of the General Land office in Washington, D.C. wrote to tell Herman that “Neither of these proposed land uses is under the jurisdiction of this office”. So, not exactly a rejection from the precursor to the Bureau of Land Management. In fact, the commissioner left open the possibility that if “…lands on Mars, the Moon or other planets…” are designated public lands of the United States, the pair might have an actual claim! Read all about it in the many newspaper clippings saved by Russ. 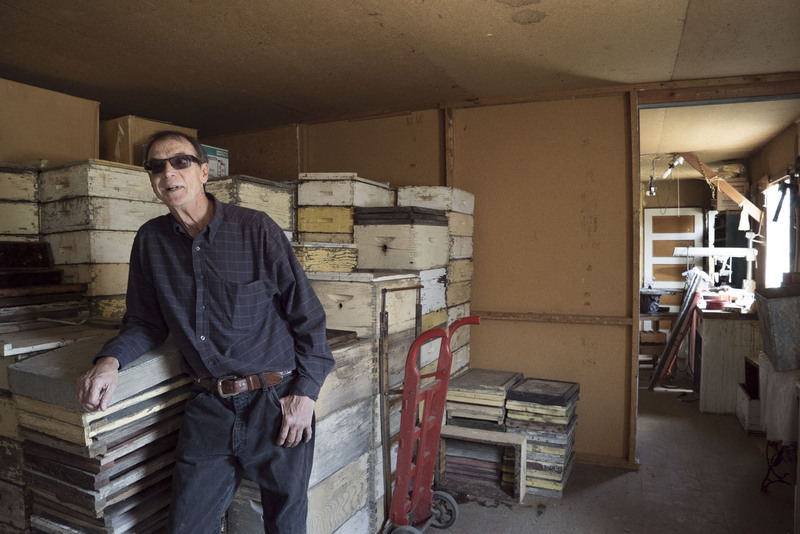 Russ Rauchfuss in a former barracks building, used as a “honey house” for the family beekeeping business. 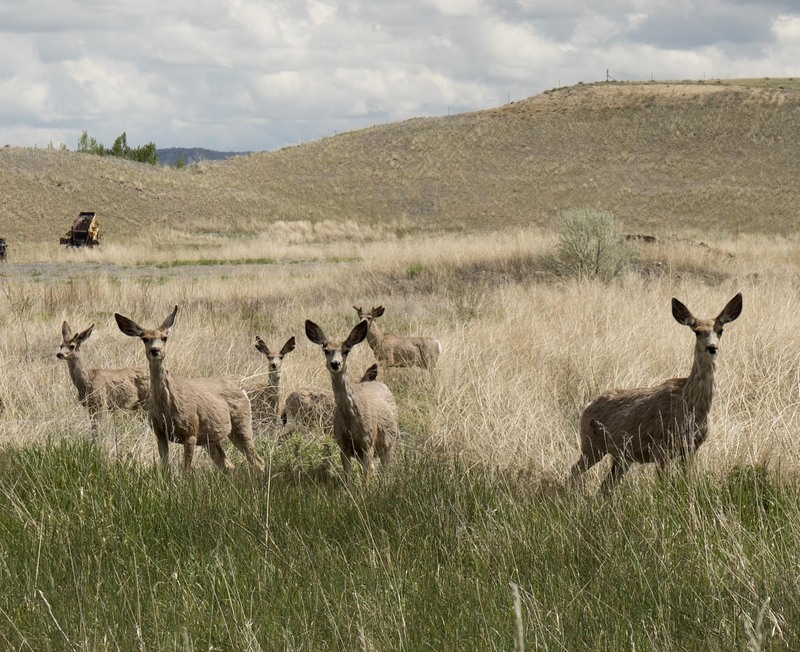 As Sharon and I were driving on a small back road later in the day, we saw a small group of deer bounding through the brush off to our right. 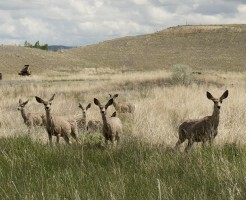 They came close to the road and stopped and stared at us as we drove. I stopped the car and the deer stood there, ears alert, just staring at us. It was quite eerie to see them close and not afraid. So we took a few pictures and drove on. I wonder what the deer were thinking? That was my Uncle Boo.All of his sister Shirley’s family,all called him that . He was a great man, with an awesome sense of humor. He is truely missed by myself. Always chewing on his cigar. As he would tell stories. Always with his unforgettable laugh.